So, it's been a while, I know (it's not like anybody reads this stuff), but I got a job you see. Yep, I was briefly employed so had all the money and none of the time. But now that I am an unemployed bum again I get to do stuff like this all day. I'm living the dream! So "What're you reading Waggy?" I hear you cry. No? Anyone? No? Well, a lot actually, stop being so nosy you swines. 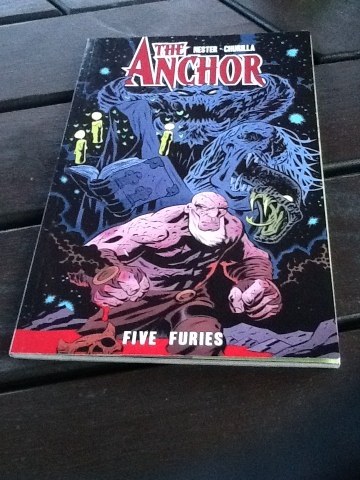 This week, I have been mostly reading The Anchor, written by Phil Hester with art by Brian Churilla. "What's that Waggy?" You ask? No? Still no one? Well, the Anchor is a holy man lost in time. He guards Hell's entrance to Earth by beating the living snot out of hordes of hellspawn, and has been for generations. Cut to the present and five furies have appeared on earth to cause mayhem and the mysterious Anchor arrives just in time to help out. But "Wait" I hear you... Ah sod it! He's still in hell too, fighting the good fight. That's the gist of the story, it's good, I'm tired, go read it. I'm not going to tell you any more because 'apparently' I spoil things all of the time, like the time I told people how Glenn from Walking Dead... erm, is a... really, nice... guy. Anyway, it's like really cheap at the Comix Shoppe too!